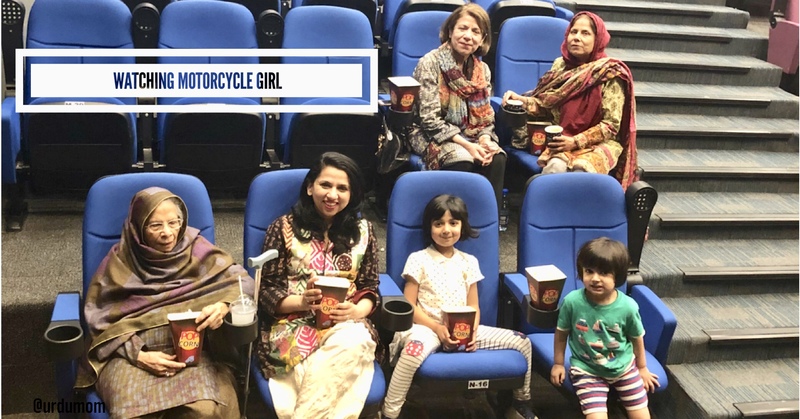 I watched Motorcycle Girl, the latest Pakistani movie, last weekend and absolutely loved it! The movie is beautifully made and is the right mix of entertainment and social messages. Here are five reasons you absolutely must watch the amazing movie, Motorcycle Girl. As you can see, even my Nani went and loved it! The story is based on the true life story of Zenith Irfan who is beautifully portrayed by Sohai Ali Abro. Adnan Sarwar has written and directed the movie along with acting in it. The movie is a realistic depiction of challenges in life that a middle-class girl in Lahore faces and how she follows her dreams. Truly inspirational. You will come out with a big smile on your face and your heart full of pride for this daughter of Pakistan. The acting in the movie is brilliant! Be it Sarmad Ali Khosat playing the villain, Zenith’s bestie, or any other character, all actors bring their best game forward. Not a single boring moment. Motorcycle girl has the right “girl power” messages delivered in a lovely manner. What I loved about the movie though is that any one watching the movie will relate to the every day struggles of middle class that the movie shows and encourages us to think bigger for a better Pakistan. You will want to pack your bags and leave for a trip to the Northern Areas of Pakistan as soon as you finish the movie! We get to see the beauty of Pakistan in all its glory through the brilliant camera work in the movie. Adnan Sarwar keeps the story realistic, relatable and yet inspirational. It’s important to recognize heros from within us and share their stories. Motorcycle girl is made from the heart. You can tell as you watch the movie not having a single extra scene, dialog or shot. Every line, character and song has a purpose. So, go out and watch Motorcycle girl! I can promise you that you will not be disappointed. I love how you are carrying your pakistaniat in foreign land and inspiring people to be proud of thier roots. As far as motorcycle girl is concerned I am glad how pakistani women are coming out of their comfort zones to claim their public spaces. I just hope more and more women will come out not just for breadwinning purpose but also because they want to breathe in the fresh air.